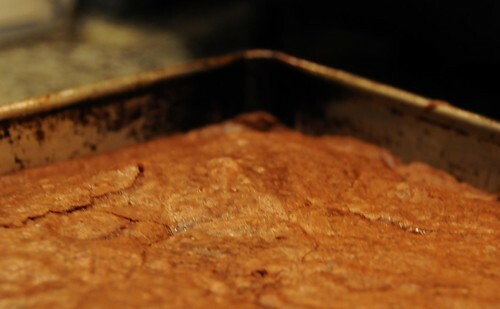 I have to admit this right at the top: well into the phase of my culinary life when I considered myself a competent, even accomplished baker, I made brownies from a mix. I hate mixes. By that, I mean that my sister once gave me the nickname Ms. The-Devil-Bakes-From-Mixes. The enmity between us is serious, but when it came to brownies, the chewy goodness of the packaged stuff always swayed me in the end. You too? Yeah, I know. But fear not! Let the chains of your oppression be broken. These are very slightly modified from a friend’s mother’s recipe. True story. Preheat oven to 350 F. Grease a square baking pan, either 8″x8″or 9″x9″. 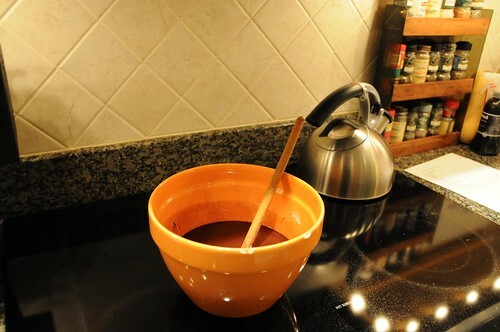 Break the squares of chocolate into quarters or smaller. If you’re really diligent, you could grate them or chop them, but I always find this too time-consuming when I want brownies. Add the sugar and mix thoroughly, then mix in the eggs and vanilla. Finally, add the flour and salt and stir until thoroughly combined. Pour into the greased pan and bake about 30 minutes. They’re done when a toothpick stuck into the middle comes out with gooey crumbs but not batter. They’re hard to cut before they cool, but worth it both ways. Baked brownies keep well in the freezer: cool, slice, wrap tightly in tinfoil, and then stick the whole thing in a plastic bag. *Would these be better if you used high-end unsweetened chocolate? No doubt. But they’re totally awesome even with whatever you can get at the store. I have a favourite recipe for fabulously rich and chewy vegan brownies somewhere. Yes, I said vegan. Stay tuned… I’ll dig it up and post it for you. You made brownies FROM A MIX? But brownies are one of the very easiest things to make from scratch, and I’ve never found any mix that beats real brownies. I don’t get it.